SKU: N/A. Tags: Cannabis Oil Vape, TKO Extracts, TKO Extracts Cannabis, TKO Extracts Cannabis Vape oil Cartridge, TKO Extracts Cannabis Vape oil Cartridges, TKO Extracts Vape Cartridges, TKO Marijuana Vape Cartridges, TKO Vape oil Cartridge, Vape Oil Cartridge. TKO Marijuana Vape Cartridges are extracts of concentrated marijuana oils. These vape cartridge sativa vape pens offer on-the-go smokers a discreet way to enjoy the strain’s potent sativa effects and delicious flavors. These vapes are portable, of good quality, and 100% safe to use. TKO Vape Sativa cartridges have long lasting effects. It is perfect for marijuana patients that need positive energy all day long. How do you use the TKO Marijuana Vape Cartridges ? TKO Marijuana sativa vape is perfect to start your day, or for use during outdoor activities. TKO vapes sativa cartridges provides a well-rounded cerebral high and uplifting euphoria. It will also boost your energy levels. It is an ideal strain to for daytime, hanging out with friends, or when you need to get work done. 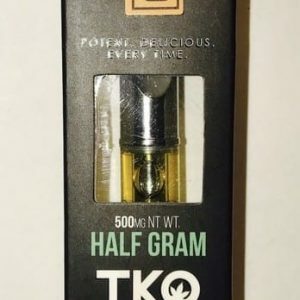 TKO Vape Sativa is a potent extract that may be effective in the treatment of many health conditions including pain, anorexia nervosa, tiredness, stress, nausea. It also delivers a cerebral buzz that alleviates migraines immediately. So powerful, my favorite carts!!!!! !